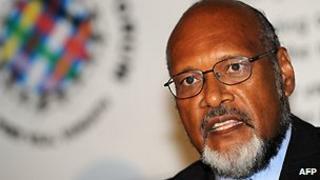 The prime minister of Vanuatu, Edward Natapei, has been ousted by a vote of no confidence in parliament while out of the country. Mr Natapei has been replaced by the deputy prime minister, Sato Kilman. Mr Natapei had left Vanuatu just hours before the vote to represent the South Pacific island state at climate change talks in Cancun, Mexico. He had earlier pushed to suspend five MPs who were trying to mount a no confidence motion against him. He had also clashed with MPs over his role in blocking Fiji's military ruler, Commodore Frank Bainimarama, from taking the rotating lead of regional trade group the Melanesian Spearhead Group. Mr Natapei was elected in 2008 but briefly lost his post in 2009 when he failed to give notice of an absence from parliament.